A brand new company to Sproat Lake has people flying around the popular recreation spot at heights up to 40 feet from the water’s surface. 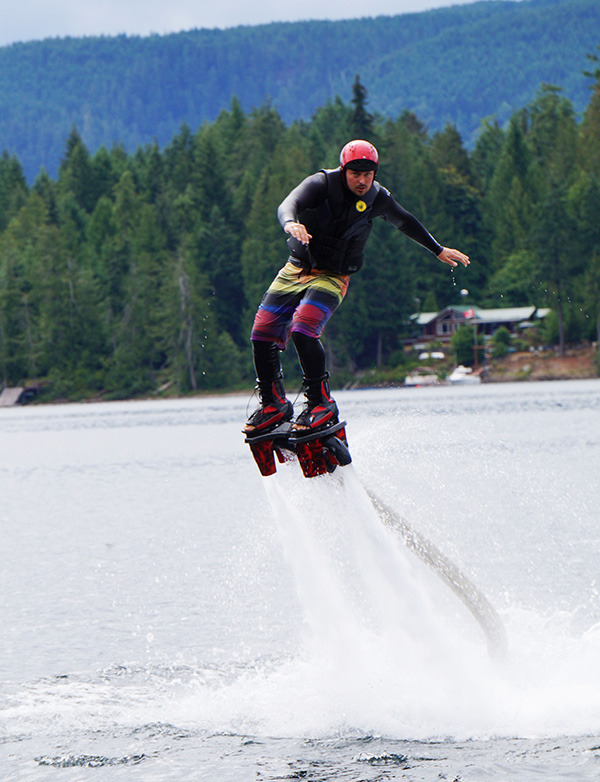 Aug. 25, 2016 3:00 p.m.
AquaFlight is a Nanaimo-based commercial flyboarding company that has found a new home at Klehkoot Marina at Sproat Lake. Flyboarding is a fairly new water sport that was invented in France in 2011 and publicly released in 2012. Riders strap into a pair of boots attached to a flyboard that has a jet nozzle underneath. A 55-foot hose is connected to both the board and a water craft, typically a jet ski. Water is forced under pressure to the boots which provides thrust for the rider to propel into the air. The use of a personal flotation device and helmet is required for the sport and a wetsuit if preferred. Dave Dee, owner of AquaFlight, said last April when he and his wife Eileen were watching a U.S. flyboarder on the TV show America’s Got Talent was when he knew he had to try the sport. Dee searched online and found a certified flyboarding instructor in Victoria and immediately went for a lesson. Not long after his first lesson, Dee was so hooked on the sport he decided to buy his own gear and jet ski to fly him and his friends around. In January the opportunity came up for Dee to open his own company at Sproat Lake under the name AquaFlight. “Nobody’s ever done it out here commercially so it was just a great opportunity,” Dee said. The AquaFlight team is made up of four instructors who are all internationally certified, which entails 20 hours of lessons and CPR training. AquaFlight instructor, Chris Sorensen, said flyboarding is typically quite easy to grasp, especially if riders have alternative board-sport experience like wakeboarding, snowboarding or skateboarding. He said generally it takes a new rider between 10 and 15 minutes to get a feel for the sport. Dee said the team has taught a lot of locals and residents in the area who were hosting summer get-togethers. “Family gatherings, that’s our target, to go to their dock and do custom packages for them,” Dee said. A one-hour lesson with AquaFlight is $250 and can be split with multiple people. To make a booking visit the team’s Facebook page: www.facebook.com/aquaflightcanada/ or call (250) 619-4150.